Slow cooker s’mores dump cake is so easy to make you can do it with your eyes closed. There once was a time when I thought the only use for slow cookers was to make dinner. I never knew that those handy little pots can whip up some delicious desserts! Take this slow cooker s’mores dump cake for example. How one earth something so delicious with such few ingredients could ever come out of a crockpot is beyond me, but it does! I could eat this stuff for days and days. You just wait and see! I am a homeschooling mama so I had my kids in the kitchen helping me make this yummy dessert the other night. Each child got to dump an ingredient in. It was a lot of fun to make s’mores dump cake as a family. I am sure you are an eager beaver to get the details on this recipe, right? head on over to the next page for a complete list of ingredients and instructions. 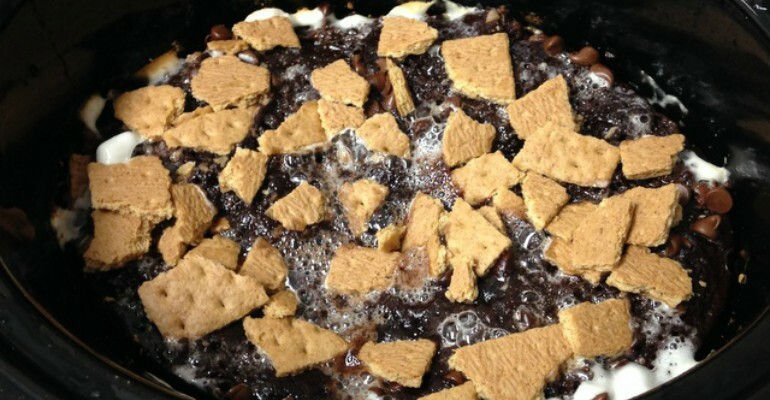 USE THE RED NEXT PAGE LINK BELOW FOR THE SLOW COOKER S’MORES DUMP CAKE RECIPE. Quick Tip: Feel free to double this recipe when feeding a crowd.